Happy 2013! At the November Board meeting the ALAO Board decided our new year’s resolution would be to improve the ALAO website. Plans and activities are underway to make this happen. The Board created a Wall Wisher account (http://padlet.com/wall/alaoweb) to collect feedback from members on the current ALAO site. The February Board meeting discussions will focus on the website and plans for conducting usability studies and a redesign. If you have feedback on the ALAO website, please feel free to share it with me or another ALAO Board member. 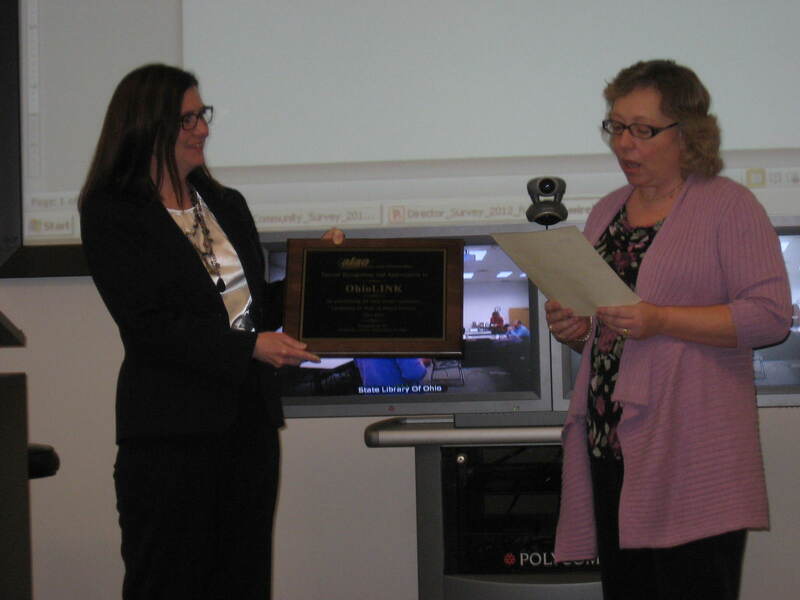 I felt so privileged, on behalf of OhioLINK, to receive the ALAO plaque commemorating OhioLINK’s twenty years of outstanding service to the library community in Ohio. As a new Executive Director, I am of course standing on the shoulders of giants — not only the enormously dedicated staff in the central office over the last twenty years, but the academic library staff in Ohio who had the vision to imagine OhioLINK and the expertise and cooperative spirit to sustain it. ALAO’s activities and membership in turn play a vital role in the development of the academic library community and have a direct impact on OhioLINK, and it is a special honor for our organization to receive recognition from ALAO. I am fully aware of just how much individual and institutional effort it takes from academic libraries in the state to make OhioLINK into a successful organization, and I hope together we can spend the next twenty years continuing to build the best statewide academic library environment in the nation. ALAO elections are right around the corner. I’d like to thank everyone who volunteered to run for office and wish the best of luck to all of the candidates. Please get out and vote for the future leadership of ALAO.